Kurt Yaeger has found success in the worlds of sports, television, and film. He is a force to be reckoned with as he defies the obstacles in life thus proving that you can do anything you set your heart and mind to. After a motorcycle accident took his leg, he not only learned to ride again, but he went back to competing. Little did he know that a few years later he would be a guest star on one of Hollywood’s most iconic motorcycle shows Sons of Anarchy. 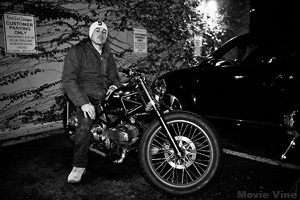 Last week marked the premiere of Rudimental’s “Waiting All Night” music video which is based on Kurt’s recovery and triumphant return to the BMX world. In a matter of hours the views on the video rose into the hundreds of thousands, and this week it is already pushing two million views. Join us as Kurt shares his secrets to success and the importance of living your dreams. MV: Welcome to Movie Vine, Kurt. 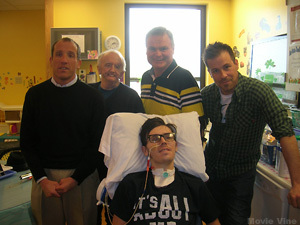 Kurt: Thanks so much for having me. MV: To begin, would you mind sharing a little about your duel careers as an actor and an athlete? Kurt: It’s pretty crazy. On one hand I focus on acting; working on the underlying psychology of a character, researching the roles and pushing it as far as I can. Most of the work is cerebral for me. On the other hand, you have being a professional athlete. You work on the physical, pushing the limits of your body and just going for it. This is more like tapping into the animal part of your being. They are both different but complimentary to one another. MV: The new Rudimental “Waiting All Night” music video shares the story of your accident, rehabilitation, recovery, and the process of learning to ride a bike again. Was it difficult to relive everything, or did you find it somewhat therapeutic? Kurt: It was difficult for sure. Sitting around, watching my friends ride while I sat with my leg off was frustrating. All I could do was tell myself “this is for filming, keep sitting here”. All I wanted to do was get up and jump off the roof with my bike like the rest of them. In the hospital scene, that was real. I began to have flashbacks of being there, being helpless and it all came back. Not sure if it was healthy or not. It was draining. MV: By sharing your story, you have become an inspiration to others dealing with the pain and frustration of recovering after an amputation. Was there anyone in particular who you looked up to after your accident? Kurt: I’m so honored to be considered as someone’s inspiration. It’s a high responsibility to be thought of as that and, even though I might fail from time to time, I hope to encourage more people to do what they love and just go for it. I really didn’t have anyone after the accident to look up to for guidance. I didn’t know any disabled people. One person who helped me was my prosthetic, Wayne, from SF Prosthetics and Orthotics. He’s a hell of a guy. MV: What advice would you offer someone who is just starting rehabilitation after amputation? Kurt: Take your time until you are ready then push it with all you’ve got. The only way to get over something is to destroy the fear of it in your mind. Then your body will follow. Some basic things are to eat right, lose as much weight as you can, less pressure per square inch, and just be as healthy as you can be. MV: Are there any vital resources you could recommend for family and friends that are unsure how to approach the subject with their loved one recovering? Kurt: I think that finding a good prosthetic is your number one priority. This is the mechanic, psychologist and priest of your situation all wrapped into one. If you do a little homework on this person and find a good one, you’ll be far better off. MV: Congratulations on your reoccurring role of ‘Greg the Peg’ on this past season of Sons of Anarchy. After your accident, did you ever imagine that you would not only get back on a motorcycle, but also co-star in a show about a motorcycle club? Kurt: Thanks! Greg was a great character to portray. He’s a member of an outlaw club who’s got a reputation to maintain while having morals which complicate his way. His trust is what gets him into trouble with Clay (Ron Perlman). I always thought I would ride again. In fact, as soon as I was able, I rebuilt the motorcycle I had the accident on. However, co-starring on a TV show about motorcycles was … unimaginable. I could not have guessed that would have ever happened. I should start playing the lottery too! MV: As a professional athlete it makes sense that you would perform your own stunts when acting. Was that an advantage for Sons? Kurt: Being able to ride motorcycles extremely well gave me a confidence as an actor which I believe helped me get the role. I know just about everything to do with motorcycles; I can completely rebuild a bike and I’m usually the guy people call when something goes wrong with their rides. Having that experience with bikes allowed me the freedom to audition with absolute confidence. MV: How much of your shooting day was actually spent riding? Kurt: The first episode we shot was mostly riding motorcycles. After that I almost did no riding on the show until the seventh episode. We might get a few shots in here and there, but it’s more about the characters at this point; the characters are established riders and they don’t need to show that too much. Though I would love to do a show where all I did was ride! I rode to and from set nearly every day. MV: Did you have any input in choosing the motorcycle you rode for the show? Kurt: I was able to pick from the stock of bikes they had. I changed the handle bars of my Fat Bob and welded a heal / toe shifter so I could shift with no issues. Besides that, it was a bike they already had. MV: You own Proton Locks which manufactures magnetic pedals for amputee riders. Do you have one on your motorcycle, or are they solely for use on BMX bikes? Kurt: Proton Locks are for bicycles of any type: BMX, mountain bikes, road bikes, recumbent, all of them. On a motorcycle you don’t really need it. Most of the time you ride you’re just relaxing with your feet (in my case foot) on the pegs and not much will knock them off. I thought about putting a magnet on my dirt bike, but the heel of the boot keeps it on fine. MV: Your production company ArtistFilm is working on a reality TV project. Are you able to share the show’s content with us? Kurt: I can share a little bit. The show is called Thrive and it’s a show that showcases the strength of the human spirit, the will people have to overcome adversity and all the while not being patronizing about their situation. It’s a show that won’t pull punches, but it also will be positive and forthcoming. I believe this show will move people to do great works in their own life while being a complete draw for viewers. MV: What can you tell us about your character Brian in Alien Hunger? Kurt: Brian is an interesting fellow. He’s needing the help of the people he’s around, but completely disregards their thoughts on pretty much any subject. He’s a jerk who happens to make you laugh. MV: You’ve been training for the US Paralympics Bobsled and Skeleton team. What is that experience like? Kurt: It’s been absolutely amazing. I never had any idea how much fun this is! I knew it was dangerous but man, is it a total blast. Any thing I get to go fast on I’ll do. MV: What was going through your mind during your first solo run down the track? Kurt: Actually it was sort of boring. Let me explain. I was told, for three days, that this was going to be the most epic thing ever, that you could die on any corner. At first I was like “yeah yeah, I got this”, but they told me that I didn’t get it, this is crazy. So after days of that kind of talk I started to think I was getting myself in over my head. I studied the course, watched every video I could find and asked every coach his thoughts on what to do. MV: Do you have any plans to compete with them in the future? Kurt: Actually I competed in four races so far. I took first in two races and third in two others. I’m completely hooked on it and look forward to next year’s training season. Hopefully I can work it all into my schedule for future film projects. A nice long series regular on a hit show where I get to play a rough and tumble guy who’s discovering life’s peaks and valleys while sending a good message to people in TV land which would be – honorable, say what you mean and mean what you say, and be generous because you can’t take it with you. Has it hit you yet that you actually found your dream role by playing Greg in Sons? Kurt: Ha! I said that!? That is amazing. Ok, so I want to have a nice long series regular role on another TV show where I get to play an undercover CIA agent who’s posing as a stuntman in Hollywood. Fingers crossed! MV: Fingers crossed! Thank you for taking the time to catch up with us, Kurt. We look forward to seeing you in all of your dream roles. Kurt: Thank you very much for having me, I appreciate it very much. 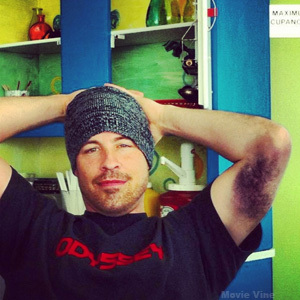 And feel free to follow me on twitter at @kurtyaeger. I run the page myself so if you get a response from me, it’s really me. *For more information on Kurt check out his official website KurtYaeger.com and be sure to follow him on Twitter. Kurt shares story in the Rudimental’s “Waiting All Night” music video below. Comments for Dream Role with Kurt Yaeger are now closed.